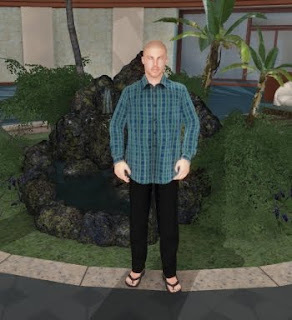 Blue Mars Blog: A Blue Year Male Makeover! A Blue Year Male Makeover! It’s a new year, and a new decade, and there are plenty of great looks in Blue Mars! Just for the guys, I’ve put together some hot looks for my male avatar with a cheat sheet to get you ready for 2011! 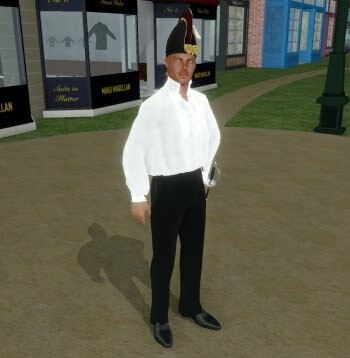 Mako Magellan may be known for his exquisite period clothing, but you will find quite a lot more in his Caledonia shop. 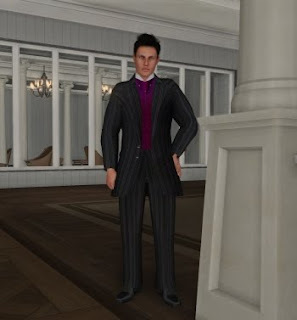 He also has suits, tuxes, and a line of casual clothing for men, complete with untucked button downs and slacks. The Aaron Shape by Moxxi in Port Town and the Pale Jack skin by Adam and Eve in Caledonia complete this look. My male avi gets a spiffed up in this grey and purple Adam and Eve suit and black Adam and Eve dress shoes, available in Caledonia. The messy hair from the Venezia costume shop and the Aaron Shape and Skin from Moxxi in Port Town finish me off for a night out on the town. 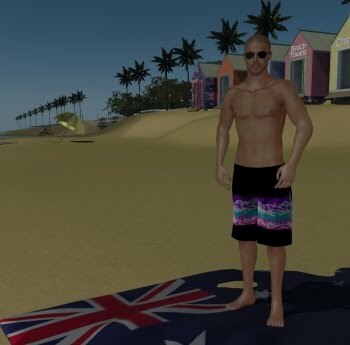 Estelle Parnall’s Fashion Esplanade is newly updated with new beach fashions for men and women. A pair of aviator shades from Sketchy Fever in Tharsis, and I am ready for the beach. Stop by Estelle’s Men’s and Executive shops for casual clothes and sophisticated business attire for men. 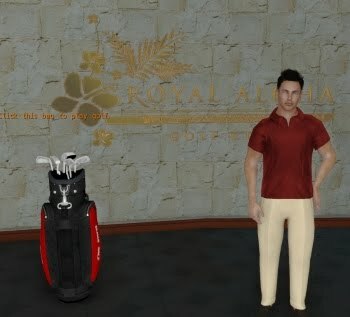 Test out our new golf clubs and golf UI in khaki pants from Adam and Eve in Caledonia, and an Estelle Parnall polo. With the James skin from Adam and Eve in Caledonia, I’m ready to tee off. 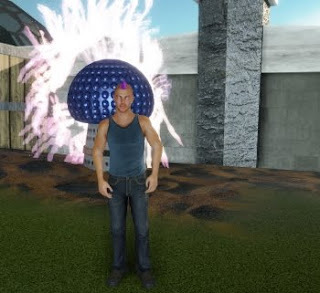 Tap into your inner wild side with a purple Mohawk from El Electron in Tharsis. A sleeveless tee, dark washed jeans and brown leather air macs, also from El Electron, are the perfect compliment. If you are feeling dashing and debonair, Mako Magellan’s shop in Caledonia can fix you up with anything you need to save even the most distraught damsel in distress, including regency era garb, a Captain’s hat, and even a trusty sword. Thanks to the intricate design work of Arzach Mills, you can embody Michaelangelo’s David, complete with granite sculpted hair. Visit Arzach’s shop in Beach City to check out all of his colourful creations. 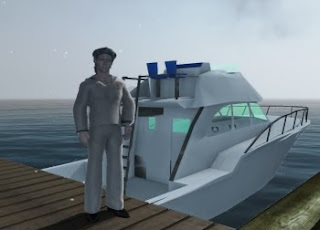 David is sporting a white sailor suit from Fizzy Pink Soda in Gaia. These are just a few of the many different personas you can put together with items from our fabulous Blue Mars devs. Check back in on our blog for the latest trends for ladies, the newest animations, and the hottest furniture in Blue Mars, coming soon! It is good to see Blue Mars menswear getting a bit of coverage to kick off the new year. A sign of things to come, I hope. I am curious about the eyes of the avatar in most of these pictures. They have a disconcertingly cadaverous quality. Why is that? Ohhh cadaverous, good word haha. Three of the male skins pictured above are from Adam and Eve in Caledonia, and they all have very striking eyes.